Des Moines-area home builder Don Beal was recently appointed by the governor to the Iowa State Building Code Advisory Council. His term began in July. Beal, president of Beal Development Corporation, which he established in 1993, is one of seven members on the Council, each of whom serve a four-year term. Their main job is to review periodic code cycles and make recommendations to the building code commissioner for the adoption of the proposed code or to consider amendments they think are appropriate. The Council holds public hearings to discuss the code and any proposed changes or amendments. The Council also acts as a board of appeals. When the prescriptive code requirement does not necessarily fit the building project being considered, the Council can approve a modification that still meets the spirit of the code. Tell us about Beal Development Corporation. We build speculative homes, custom homes, and some light commercial. 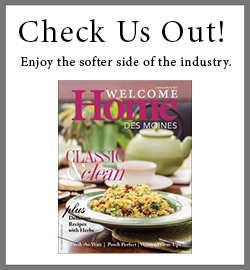 We are based in and serve the Des Moines metro area. We have two employees—a property manager and a site manager. Prior to Beal Development, I was in the building business from 1971 to 1993. So I’ve been in the Des Moines home building and apartment business for more than 40 years. What do you hope to contribute to the Iowa State Building Code Advisory Council? The Council is made up of varying disciplines— mechanical engineering, structural engineering, and architecture. A couple of us who are contractors, and I think that brings some practical experience to the group. That’s what I think I have to offer. When you first started in the home building business, describe what the building codes were like. How have they changed since then? Building codes have changed by leaps and bounds. In the past, they did their job but they weren’t near as detailed or as complex as they are now. Some areas where we’ve seen changes in code include energy performance, stair geometry, fire-retardant materials, and structural requirements including soil testing, shear walls, tie downs, etc. Back in 1971, the United States was operating from three distinctive code writing agencies. There was a specific code for the Southern states, the Eastern states, and the area west of the Mississippi. Now those have merged into one code writing agency called the International Building Code Council. What is the biggest challenge facing builders today when it comes to code compliance? I’m currently involved in a residential/commercial project, and really the toughest things to comply with right now are fire-rated construction and structural requirements, which involve higher costs for materials and complexities in the specifications. With regard to single-family homes, the additional costs to the home builder get passed down to the home buyer, and for every $1,000 that a house has to increase in price, there are a number of people who are priced out of the market. We are not talking about mansions. These types of increased costs affect affordable housing for young couples. This makes it tough for builders, who not only have to build a home in compliance with the codes and regulations, but also find buyers willing and able to pay the price. What changes in building regulations do you see coming down the pike? How will they impact the builder? The homeowner? There are two things possibly on the horizon that could increase the cost of housing. One is a requirement mandating fire-retardant sprinkler systems in single-family homes. That additional expense means that many more people won’t be able to afford a house. The other is the Environmental Protection Agency’s topsoil preservation requirement, which involves having the same amount of topsoil at the end of a project that you did at its inception. Describe your involvement with local, state, and national home building groups. What role do you play in each group? Why has it been important to you to participate in these trade groups? I sit on the board of directors of both the Home Builders Association of Greater Des Moines and the Home Builders Association of Iowa, and am also on the executive committee for the latter. I am also Iowa’s state representative to the Executive Board of the National Association of Home Builders. I’m a member in these groups because it’s rewarding and it’s my way of giving back to the trade. It has been said: “Every man owes a part of his time and money to the business or industry in which he is engaged. No man has a moral right to withhold his support from an organization that is striving to improve conditions within his sphere.” I believe in that. I also enjoy the networking and educational aspects of these organizations. There is a selfish reason behind my involvement. If, through government affairs, I can mitigate the costs associated with some of these recent requirements, it helps provide my buyers with more affordable housing. I love working in an industry where we’re creating something. I love to see an apartment building or a house come out of the ground. I’m on my job sites everyday. I know firsthand what’s going on and what’s happening. Are there any charities you’re involved with? I was just appointed to the board of directors of Habitat for Humanity in June. I’ve been involved with the group in the past, supervising the building of four or five houses. Through their work, they’re building homes, communities, and hope. When you have some free time, what do you enjoy doing? I mow grass, I boat, and occasionally fly.